Asteroids has always been a classic game, and this is a simple remake of it, although apart from the graphics, nothing new has been added to it. The aim is simply to blast all the meteors off the screen, but when you shoot a meteor, it splits into two more meteors, and these meteors will also split into two meteors, so there will be problems if you shoot randomly! 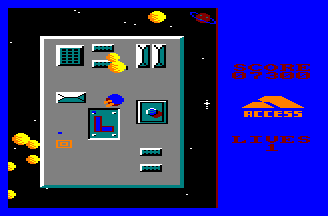 Your spaceship is also difficult to control, and getting out of a tricky situation where a barrage of meteors is heading your way requires some skill. However, there's nothing exciting about this game; the screen is far too small, there is only one (yes, one) sound effect, and you can't shoot accurately. Inside an asteroid is a labyrinthine complex known as Metaplex, where the evil Garth is planning to destroy Earth. You must assassinate Garth, but first you must weaken him by dropping acid on four power units scattered around the complex. You must first find a flask, then find the tank of acid so you can fill the flask before you can destroy a power unit. The complex contains numerous aliens which will deplete the shield of your craft; if your shield runs out then you must find a new craft. There are also security control units which will activate or disable certain doors and barriers, but there are so many combinations that it needlessly makes the game more complicated than it should be. The graphics are relatively poor, and the size of the labyrinth makes this a tedious, run-of-the-mill game. Hurtle down obstacle-strewn corridors in a race against time. This challenge requires very fast reflexes and an ability to predict the oncoming obstacles and the best way to dodge them. The corridor is riddled with slime tiles that slow you down, hurdles to jump over, glass panels that will break if you run across them, among other hazards. 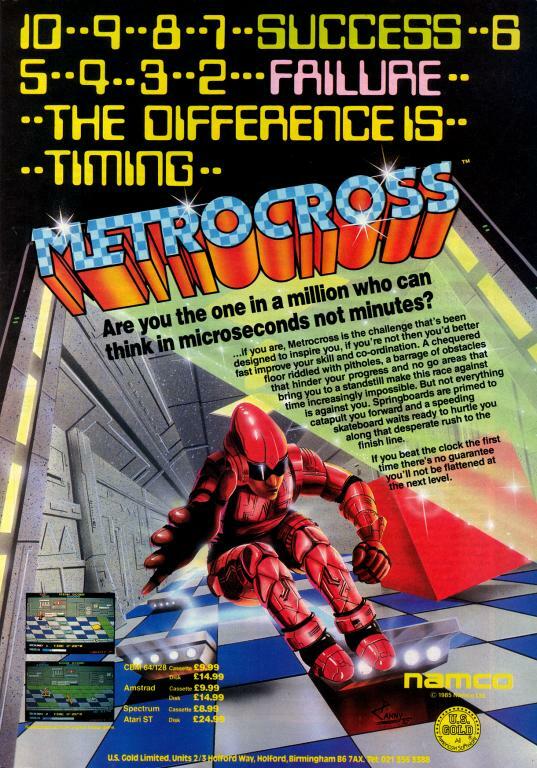 Fortunately, there are springboards and skateboards to help you out, and you can also jump on cans to make you run a lot faster or stop the clock temporarily. The first few levels are quite easy to complete, but on subsequent levels, the time limit becomes very tight and you can't afford to make any mistakes! The graphics and tune are both very jolly as well, and it's a great game overall. 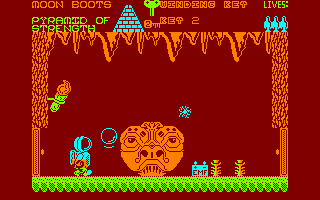 Moonboots is an explorer who has somehow managed to end up lost in Metropolis. Now he has to find his spaceship and return to his home on the moon. 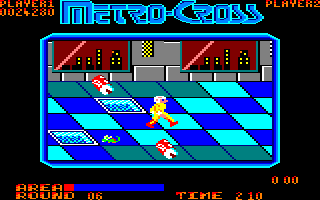 From the moment you start playing this game, it's clear that it was influenced by the Wally Week series of games, as the style of gameplay is exactly the same – walking around collecting objects (and you can only carry two at a time) and using them to reach new locations or perform tasks. Unfortunately, it's absolutely horrible to play. For a start, the graphics are seriously ugly. 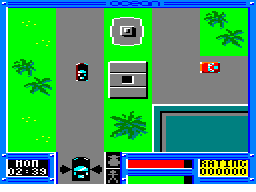 It's a Spectrum port, complete with colour clash as well, and Moonboots walks very slowly, so it takes ages to walk from one place to another. This is a very poor and very dull game which will seriously test your patience if you play it! Following a nuclear holocaust, Metrópolis is the last city remaining on Earth. However, anarchy reigns in the city, and a gang called the Townsmen have decided to restore law and order. You are their leader Geitor, and they are relying on you. You must explore the city, and armed only with a sword and shield, you must engage in battle with the various criminals that inhabit the city. However, your main goal is to find five tanks and destroy them by staying within their range of fire until they run out of ammunition! Unfortunately, this platform game is quite disappointing. The graphics are of a high standard, but there are hardly any sound effects and the game moves at a very slow pace indeed. You also have only one life, and it's too easy to mistime a swipe of your sword and lose a lot of energy against an enemy. There have been several murders on the little island of Sark, a peaceful place between France and Britain. As a renowned inspector, you're sent there to investigate the case. The problem is that you have only one day to find the murderer! 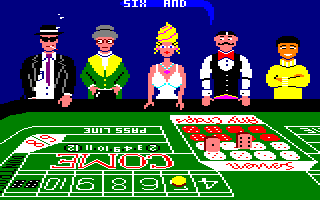 This is the third murder mystery adventure from Cobra Soft, and the graphics are rather good, but the sound effects are very scarce – but does it really matter in this kind of game? The biggest flaw of the game is its difficulty. You must be really lucky to find any clues, because the time goes by so fast! It's a really interesting game, anyway. In this game, you drive a magnetic tank and you must destroy the entity that has taken control of a space station. When you move, your tank faces the direction you want to go, but it needs time to rotate. There is almost no gravity, so you can't stop easily, and you have to anticipate each of your moves. There are a lot of laser beams and other traps that will destroy you if you make any wrong moves... To make things harder still, you'll have to move over icy narrow bridges, and you've got only one life! You'll also have to activate switches to open doors and find lifts to reach the platforms. Well, there are many things to discover in this great game. 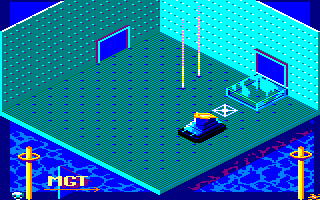 The isometric graphics are really good, the sound effects are OK, and the space station is huge. A very addictive game! Race your Mustang Cobra around eight tracks. Each track is divided into four stages, although you don't have to reach every stage within a certain time; your time limit is for all four stages. To help you along, you've also got a supply of turbos, although it's best to use them cautiously or you'll crash off the circuit and lose time. 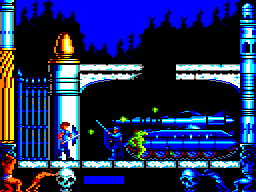 The graphics are simple and colourful, and the colours change when you reach a new stage. However, the scenery stays more or less the same on each level. 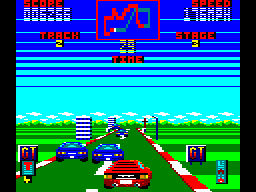 It's just a rather average driving game, really. Craps is a casino game with an extremely complex betting system. Several players gather around a craps table, throw dice and bet on the outcome. If a player rolls 7 or 11 (a natural) on his first roll, he wins; if he rolls 2, 3 or 12 (craps), he loses. Any other number rolled is a point, and the player rolls again until he rolls the same point (meaning that he wins) or a 7 (meaning that he loses). If that wasn't complex enough, there are all sorts of bets you can place – pass line bets, don't pass line bets, come bets, don't come bets, place bets, field bets, big 6 and big 8 bets, and proposition bets. The graphics are very good and the characters are wonderfully animated, and the music is entertaining as well, but unless you can make sense of the betting system (and I can't), you won't enjoy this game. Based around the 1980s cop show of the same name, this game is split into two very different parts. 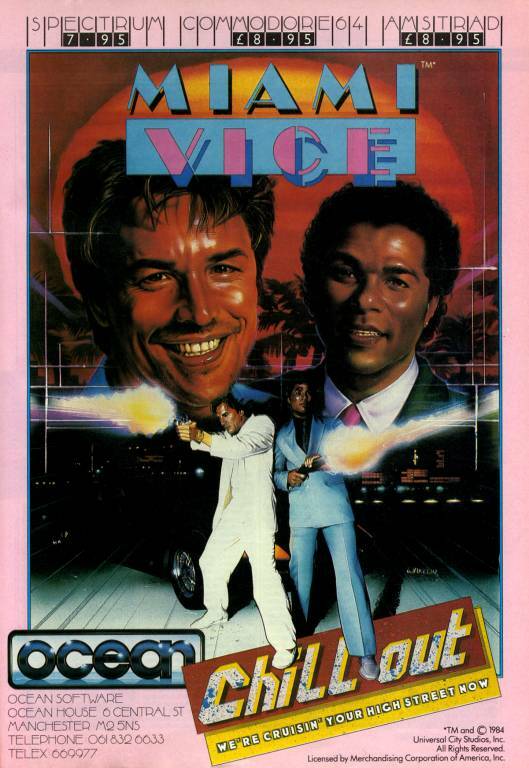 You start off the game driving around Miami in your fancy car, avoiding other traffic and shooting out the window at other cars, but pull up outside one of the many trouble hot-spots (places like Joe's Café) and the game goes into shoot-'em-up mode as you wander through the building, taking out the bad guys or interrogating them. It's a good idea, but it doesn't really work, as the driving bits are really difficult, and nine times out of ten, you'll enter a building to find the bad guys have just left, leading to a lot of aimless driving. The graphics, particularly in the driving parts, are really bland and uninspired, and the sound is little better. A disappointing cash-in on a great TV show.